If the Bimp’Air technology made itself known in the first instance in the bike universe, it is not limited to it. Recently the Bimp’Air technology was awarded with the ‘Cap’Tronic Trophy’ in the category ‘Product for consumer use’. It now opens up new horizons and shows that it is really a part of everyday life and becoming the new inflation tool for home. 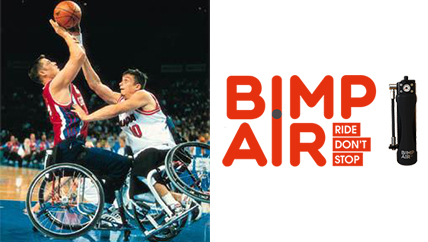 Compact, fast, and easy to use, the Bimp’Air capsule becomes the best ally of those for whom inflation is a necessity, such as people with disabilities. Indeed, the wheelchair user should check the inflation of its wheels every 15 days to avoid dangers such as unstable driving, reduced braking performance, or difficult manipulation. The bicycle pump is not suitable for an optimal inflation, it is therefore advisable to users of wheelchairs to use the charging terminals provided at gas stations or a foot pump. Often a flat tire or a tire deflation takes you by surprise and it is not necessarily obvious to travel with a heavy foot pump… For these logistical and comfort reasons, Bimp’Air is a worthwhile asset. The Bimp’Air capsule has a compact design with a diameter of 4.6 cm and a length of 20 cm. It weighs 375 grams and once charged contains 9.5 liters of air at 50 bars. Its pressure gauge with needle allows you to check the pressure and balancing of your inflation in just a few seconds and without effort. Real inflation station, autonomous and rechargeable over and over in just a few minutes with the E – WAY system, it allows you to get the correct inflation pressure, it provides a better feel to the ride and above all avoids tire wear. The capsule filled with high pressure compressed air has numerous advantages: easy to carry, easy to use, non-polluting, it allows taking care of the wheels while increasing their tire life. In addition, it can be very useful for disabled sports clubs when it comes to re-inflate the wheelchairs before training and competition.